Tornadoes and hurricanes are often confused. Think of The Wizard of Oz and it should conjure up visions of one of these weather phenomenon. Do you know which one? (check the bottom of the page to see if you're right!). Tornadoes occur in most parts of the world. However they are most frequent over the continental plains of the USA. Tornadoes are typically identified as a funnel of spiraling air descending from the base of clouds to the earth. 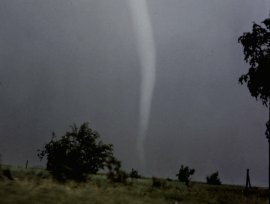 The tornado is usually narrow, about 1/2 km wide and rarely does it move more than 20 km. Like hurricanes the precise mechanism of how the funnel forms in not understood.